There is a hillfort on summit named Rathcoran and a second one to NW. The entry in PNCW for Rathcoran refers to an article on The Excavation of a Burial Cairn on Baltinglass Hill in PRIA xlvi (1941), p. 221. This makes it clear that Baltinglass Hill is the English name of this height. Has been called Coolanarrig. Baltinglass Hill is the 990th highest place in Ireland. 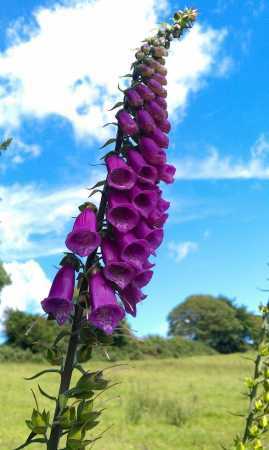 Picture from Dessie1 : Foxglove on Hill.